Our goats play a huge role in our business and our family. 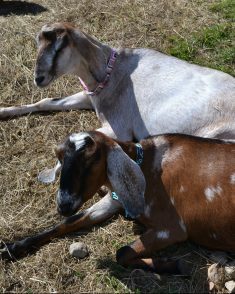 At Groovy Goat, we have a mixture of Alpine, Nubian and Saanan breeds. Our goats are very lovingly cared for. They are hand milked twice daily and we are usually milking anywhere from four to six goats at a time. 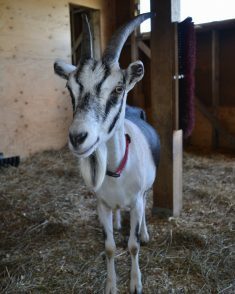 Each goat can produce up to four litres of milk per day, giving us more than enough milk to make all the soap we need! Early spring is a very busy and exciting time on the farm. This is when kidding season begins (if you didn’t know that a baby goat is called a kid, you do now!). Our goats usually have between one and three kids each, meaning that our herd grows very quickly during this time of the year. Our friendly goats love visitors so, if you are in the Ingonish area, be sure to stop by for a farm experience the whole family will enjoy! 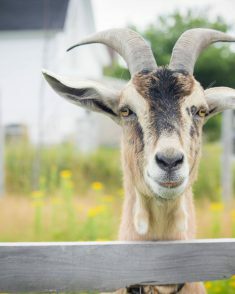 Please click on “experience the farm” to find out more information about our petting farm and guided “barn to bath” farm and soap making tours.